Robert “Bob” Renken, 73, of Olathe, KS passed Fri. Oct 5, 2018. Visitation will be 10AM Wed. Oct 10th at Penwell-Gabel, Olathe Chapel with his service to follow at 11AM. Inurnment with military honors will follow at Olathe Memorial. Bob was born November 25, 1944 in Beloit, KS to Earl and Judy Renken. He graduated from Salina High in 1962 before joining the United States Marine Corp from 1963-1966. Bob served in Viet Nam. He then went on to attend Pittsburg State University in Pittsburg, KS graduating in 1969. Bob married Linda Wilkerson December 2, 1972 in Independence, MO. After traveling around the country working in the mechanical piping industry, they settled in Olathe in 1990. Bob was a Lead designer in the mechanical industry working for Kiewit Eng. before retiring in 2009. 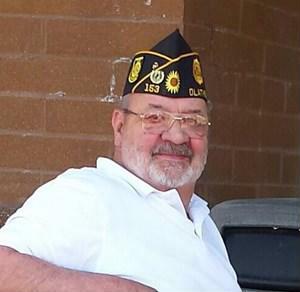 Bob was a lifetime member of the American Legion, DAV, and VFW. He was a big supporter of our Veterans. He was preceded in death by his parents and his son Bradley Renken. He is survived by his wife of 45 years Linda Renken and 4 children Tara Jo (Renken) Barnes, Trent Scott Renken, Robert Troy (Sherry) Renken, and Terry (Rhonda) Renken. He is also survived by 11 grandchildren, 4 great grandchildren and his 3 sisters Pat Newsome, Beverly Payne, and Debra Hemmy. 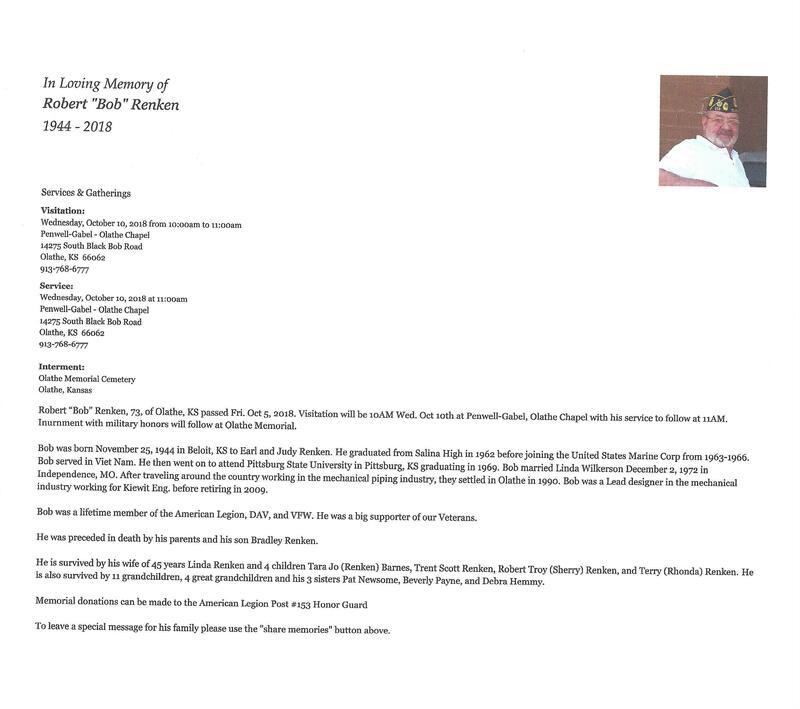 Please share your memories of Robert E..